I'm a critical person if i may admit so myself. Things that puts me off when it comes to food/restaurants in general- instagrammable food (since they can't score in the taste dept, why not make them look pretty at least), trends (think rainbow cake, bingsu, cheese toast, fusion etc. ), and also strange names. Beast and Butterflies at M Social Singapore happen to fall into 2 of the above categories (Asian fusion and the weird thing thing), BUT they also made a successful attempt in changing my prejudice. 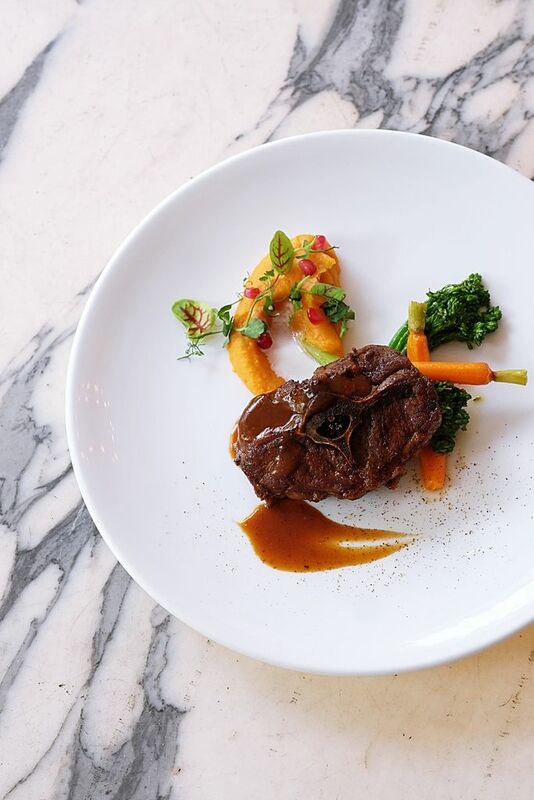 If you must know, the menu is divided into 2 categories- 'Beast’ for hearty and bold flavors; and ‘Butterflies’ for lighter cooking styles to bring out natural flavors of the ingredients. Instead of Asian fusion, i would say that the food is traditional Chinese with an unexpected twist. We started with a Tomato Latte ($9), possibly the most non Asian tasting dish we tried. The gazpacho was a refreshing palate cleanser with the tastes of capsicum, crunchy smoky bacon bits and basil oil pearls. The Scallop Carpaccio ($26) may sound Japanese or Italian but every bite was Cantonese. 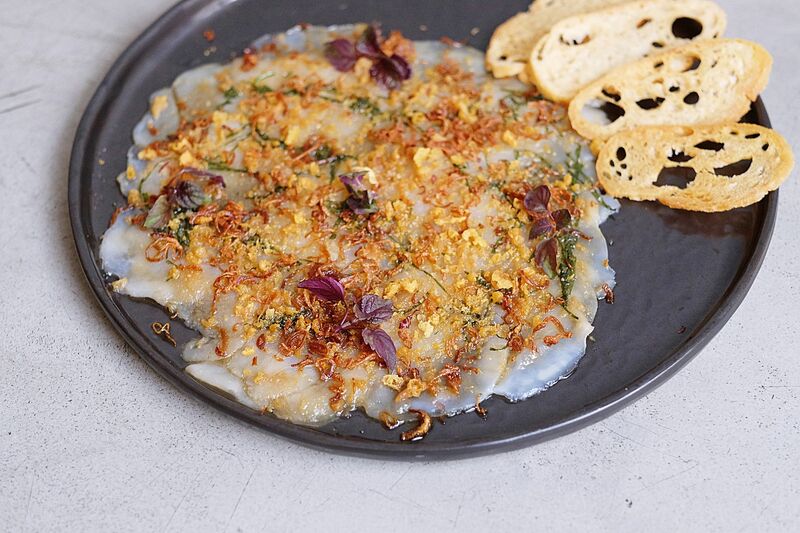 The Hokkaido scallops are thinly sliced, marinated with yuzu and sesame oil, and topped with shiso leaves, crispy flour bits and fried shallots. If you close your eyes and have this, you'd probably think that you're having cheong fun (steamed rice rolls). I love the umami flavors in this one! 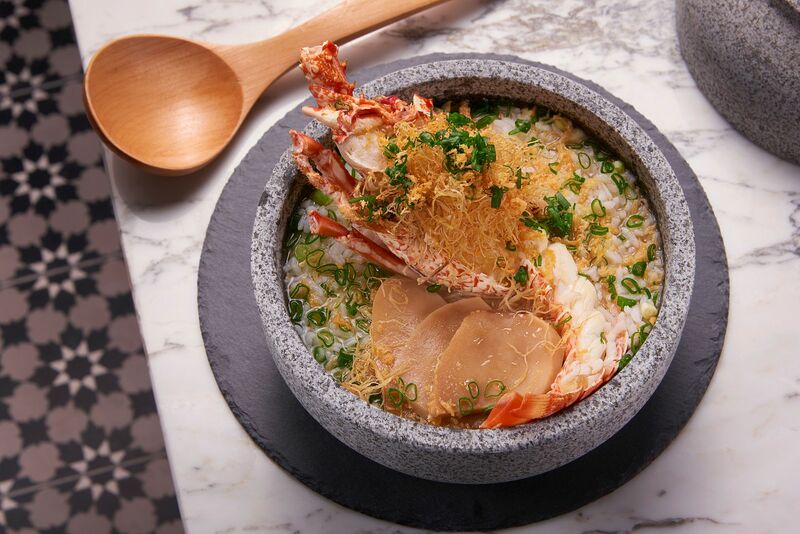 Another favorite was the Lobster Porridge ($38), which is perfect wet weather comfort food. The clear crab broth is simmered for eight hours to give that sweet seafood flavor. The bonito flakes add lovely smokiness to the soup as well. Other than lobster, there're also abalone slices in this Teochew style rice porridge. 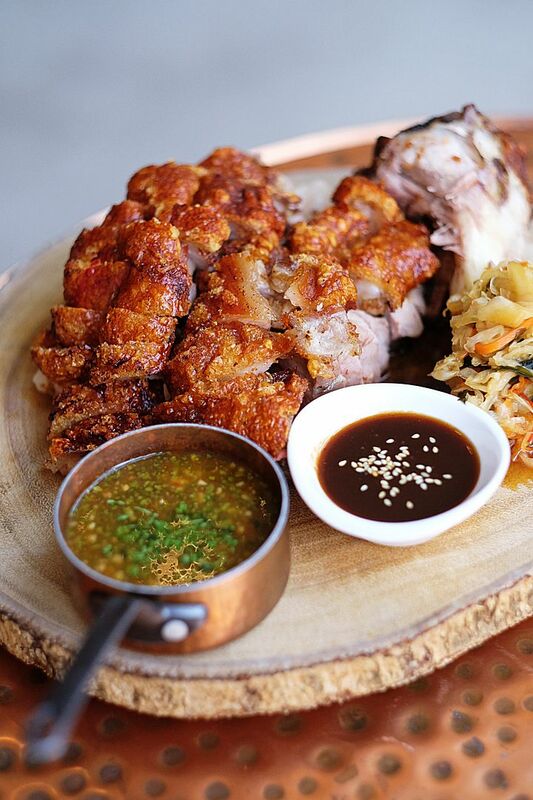 For meats, make sure you order that Crispy Pork Knuckle ($26 half/ $36 whole). The German- style pork knuckle is roasted to a crispy crackling exterior but the meat remains juicy! Dip is into a spicy Thai Nam Jim sauce (very addictive) or a Peking-style Hoisin sauce. The meat comes with a refreshing side of sesame oil scented sauerkraut. Order this to share for sure! I was expecting something more robust from the Szechuan Lamb Steak ($38) but i couldn't detect any sichuan flavors in this one. I'm sure the spices must have done something to the meat, perhaps to remove it of any gaminess. The coconut-infused sweet potato mash tasted a little more like a dessert to me though. 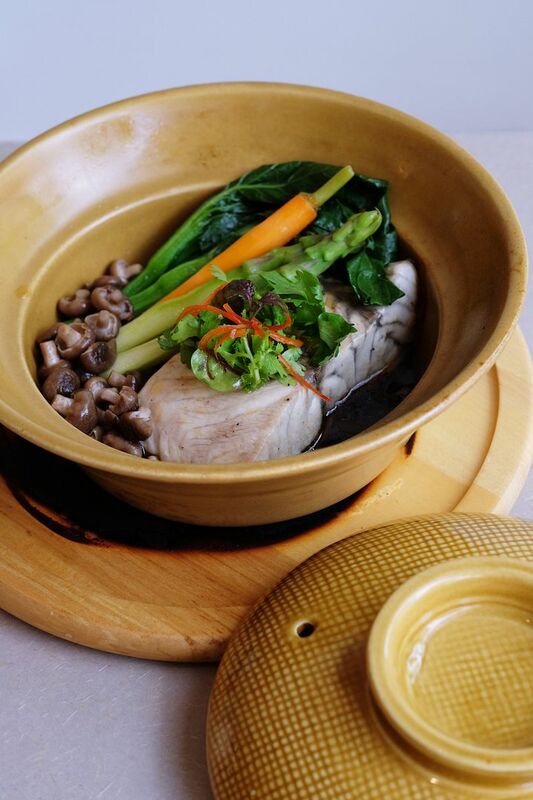 Another typical light tasting meat dish is the Scallion Soy Barramundi ($26) baked with spring onion and ginger, sautéed asparagus, Hong Kong choy sim, shimeiji mushrooms and carrots. 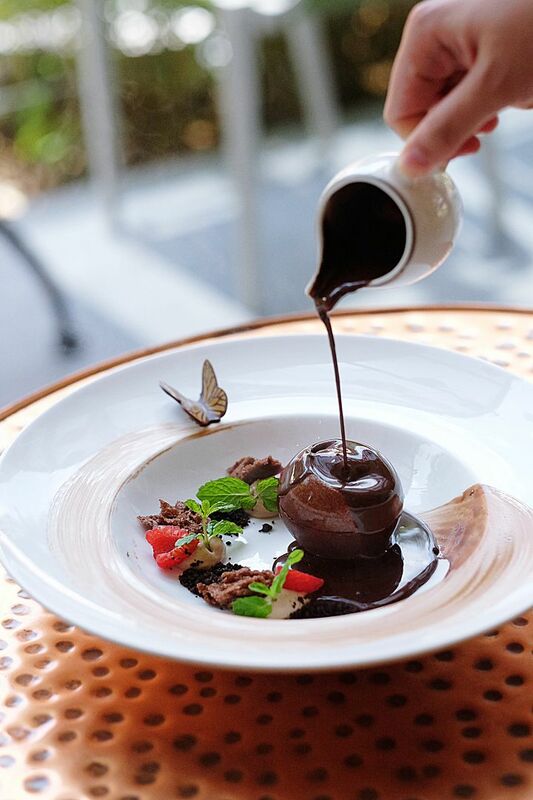 This is definitely a 'Butterflies' dish as you can taste the sweetness of the meat. I thought this was just a typical Cantonese dish! The asian dessert we had didn't fare that well. 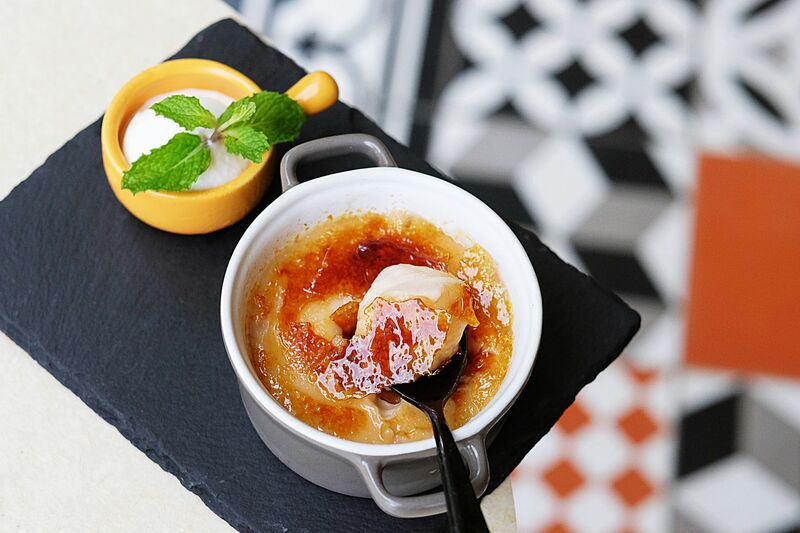 Yam Brulée ($12) is a caramelised or nee, served with a coconut icecream (that was more sorbet-ish). The Chocoholic ($12) is an overdone melted chocolate dome but we enjoyed the surprise coconut ice cream and banana hidden inside nonetheless. Overall, i was pleasantly surprised by Beast and Butterflies! Round up a group of friends and head over to B&B for some interesting Chinese food in a chill setting. Asian inspired cocktails ($19 each) are also available here.